A Polar Satellite Launch Vehicle lifted off early Wednesday with an assortment of payloads for the Indian government, domestic universities, and institutions and companies from Indonesia, Canada, Germany and the United States, including a pathfinder satellite for Google’s Terra Bella Earth observation division. The PSLV launched at 0356 GMT Wednesday (11:56 p.m. EDT Tuesday) from the Satish Dhawan Space Center, India’s primary spaceport situated on Sriharikota Island on the country’s eastern coastline. Launch occurred at 9:26 a.m. local time in India. 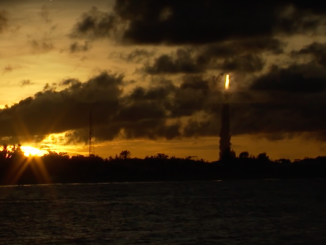 The 145-foot-tall (44-meter) rocket, boosted by six strap-on motors packed with 12 metric tons of solid propellant, climbed into a clear morning sky, initially veering southeast from the launch base, then turning south once over the Bay of Bengal. The unusual trajectory, called a “dogleg” maneuver, was required to avoid flying over Sri Lanka. Four of the strap-on motors will ignited at liftoff with the PSLV’s solid-fueled core stage, then the last pair fired at T+plus 25 seconds. Moments later, the PSLV accelerated faster than the speed of sound. The first four boosters peeled away at T+plus 70 seconds, followed by separation of the other pair at T+plus 92 seconds as the PSLV soars at an altitude of 29 miles (47 kilometers). The PSLV’s first stage motor burned out and jettisoned at approximately T+plus 1 minute, 49 seconds. A fraction of a second later, the second stage’s liquid-fueled Vikas second stage engine turned on with a puff of exhaust visible to ground-based cameras. The Vikas engine produced 180,000 pounds of thrust and burned 42 metric tons — more than 90,000 pounds — of hydrazine and nitrogen tetroxide propellants during two-and-a-half minutes of operation. The PSLV’s heat shield, or payload fairing, fell away in two halves at T+plus 2 minutes, 35 seconds, to reveal the 20 satellites packaged on top of the rocket. A third stage solid rocket motor ignited at T+plus 4 minutes, 22 seconds, at an altitude of 135 miles (217 kilometers). Finally, a twin-engine liquid-fueled fourth stage assumed control of the mission at T+plus 8 minutes, 17 seconds, for an eight-minute firing to reach the proper speed to enter the mission’s targeted polar orbit. Telemetry data radioed to mission control from the rocket’s fourth stage showed it reached an orbit about 315 miles (507 kilometers) in altitude, about two miles higher than predicted and well within the mission’s allowable error, according to B. Jayakumar, the Indian Space Research Organization’s mission director for Wednesday’s launch, codenamed PSLV-C34. The flight was the 36th PSLV mission since its debut in 1993, and the fourth PSLV launch this year. It was the 35th successful PSLV flight in a row since the launcher failed on its maiden mission. “By marking 35 consecutive successful missions today, forging closer and closer to the ultimate reliability figure, PSLV has now become a success symbol for ISRO and for the country,” said P. Kunhikrishnan, director of the Satish Dhawan Space Center. 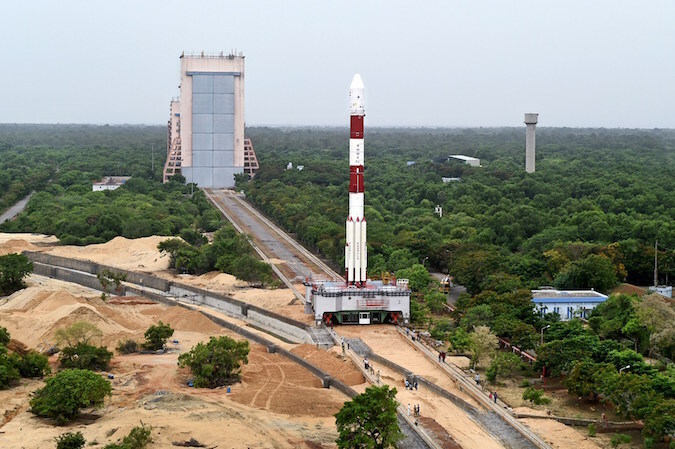 The prime payload aboard the PSLV was a Cartosat 2 series Earth imaging craft to feed high-resolution mapping data to the Indian military, according to the Hindu newspaper, a leading English-language news outlet in India. It will be the sharpest-eyed satellite ever launched by India, the Hindu reported, with the ability to resolve objects on the ground as small as 60 centimeters (2 feet). The military-backed Earth observation satellite is similar to two previous civilian craft launched by India in 2008 and 2010, but the payload aboard Wednesday’s PSLV flight went into a lower orbit than the earlier satellites, yielding improved views of strategic targets around the world. ISRO did not disclose the Cartosat 2 series satellite’s capabilities or reveal a specific name for the imaging platform launched Wednesday. With a launch weight of 1,604 pounds (more than 727 kilograms), the satellite carries visible cameras to capture black-and-white and color imagery during a five-year mission, according to ISRO. The spacecraft separated from the PSLV’s fourth stage at T+plus 17 minutes, 7 seconds. “The imagery sent by the satellite will be useful for cartographic applications, urban and rural applications, coastal land use and regulation, utility management like road network monitoring, water distribution, creation of land use maps, precision study, change detection to bring out geographical and manmade features, and various other Land Information System (LIS) and Geographical Information System (GIS) applications,” ISRO officials wrote in an official brochure for Wednesday’s launch. M. Annadurai, director of the ISRO Satellite Center, confirmed that the Cartosat 2 series satellite’s power-generating solar panels unfurled soon after separation from the rocket. Once the largest satellite is cast away from the rocket, the upper stage sent pre-programmed commands to release the other 19 satellites. 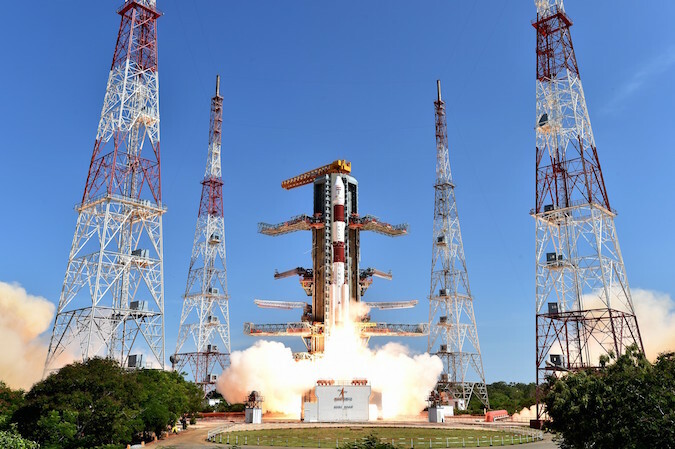 The secondary payloads included 13 satellites from the United States, continuing a trend of U.S. companies turning to India’s PSLV to haul up small satellites. The first U.S.-made satellites launched on a PSLV mission last year after a decade-long ban introduced by the U.S. government to foster growth in the small satellite launch industry. The purpose of the restriction, which is still in place, is to keep foreign government-backed rockets like the PSLV from snatching up payload launch contracts in an unfair price advantage with commercial launchers developed in the United States. But no such rockets are currently commercially viable in the United States, with dedicated small satellite launchers still yet to be flown by companies like Virgin Galactic, Rocket Lab and Firefly Space System. Orbital ATK is lobbying for the right to a change in law to allow it to offer commercial launch services with surplus Minuteman and Peacekeeper missile stages, a capability now limited to flights with U.S. government satellites. The Russian-Ukrainian Dnepr rocket program, which captured a significant share of the small satellite launch market over the last 15 years, has been halted by deteriorating relations between the those two nations. SpaceX discontinued its small Falcon 1 rocket after 2009, focusing efforts on the larger Falcon 9 launcher. Companies like Spaceflight Industries, a Seattle-based firm that arranges rideshare launch opportunities for small satellites, convinced the U.S. government to grant waivers for U.S. satellites to launch on PSLV missions starting last year. Antrix Corp., a state-owned company, is responsible for sales of PSLV rides on the international market. The 13 U.S.-built spacecraft on Wednesday’s PSLV launch included the first second-generation Earth observation satellite for Terra Bella, a Google company formerly known as Skybox Imaging. The 242-pound (110-kilogram) satellite, built in California’s Silicon Valley by Space Systems/Loral, has an Earth-viewing telescope to capture sub-meter (less than 3-foot) resolution imagery and high-definition video clips as it sails around the planet in orbit. The craft is the first of 13 Terra Bella SkySat satellites scheduled for launch this year. Four more satellites are under contract to Arianespace for will liftoff on a European Vega rocket from French Guiana as soon as September, and six SkySats will launch on an Orbital ATK Minotaur-C booster as soon as October from Vandenberg Air Force Base in California. A dozen tiny Dove “Flock 2p” nanosatellites also launched Wednesday on the PSLV. Built and owned by Planet, a venture capital-financed company headquartered in San Francisco, the Dove satellites are about the size of a toaster oven, but they are packed with camera gear and processors to gather a nearly continuous stream of high-resolution images. Planet has launched more than 100 satellites since 2013, primarily aboard resupply ships heading to the International Space Station, where the compact craft were deployed from a pod outside the research outpost. Planet said most of its future launches will be aboard rockets like Wednesday’s PSLV flight heading for sun-synchronous orbit, a path over Earth’s poles that allows the satellites to see the entire planet. Planet’s goal is to image the entire world every day with a fleet of more than hundred nanosatellites. Launches from the space station go into a lower-inclination orbit unsuited for global imaging. Spaceflight Industries handled launch services for Planet’s secondary satellites launched by Wednesday’s PSLV flight. 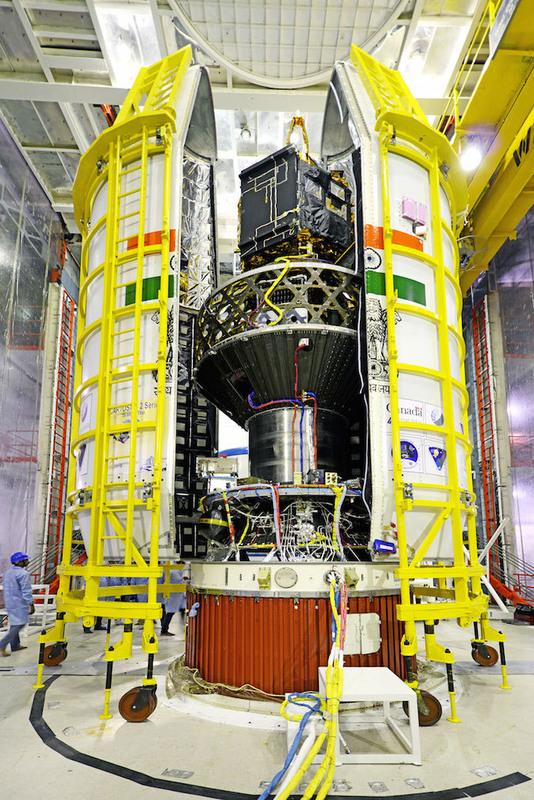 Two Canadian satellites were also stowed inside the PSLV’s nose cone for launch. One of the spacecraft, called M3MSat, waited two years for a ride into space. The 187-pound (85-kilogram) satellite was supposed to launch in mid-2014 on a Russian Soyuz rocket, but the Canadian government pulled M3MSat from the launch after Russia’s annexation of Crimea. Canadian officials re-booked M3MSat for an Indian launch in 2015. M3MSat is a joint project managed by the Canadian Space Agency and Defense Research and Development Canada, part of the country’s Department of National Defense. The craft will test a new antenna to monitor ship traffic from orbit, instrumentation aimed at detecting static energy build-up in satellite electronics to improve the health and safety of future space missions. The other Canadian payload on Wednesday’s launch was a demonstration satellite for GHGSat Inc., a Montreal company which hopes to field a fleet of small spacecraft to monitor greenhouse gas output, supplying data to corporate customers who want to manage their emission rates. The company’s first satellite, named GHGSat-D and nicknamed “Claire,” is about the size of a microwave oven. 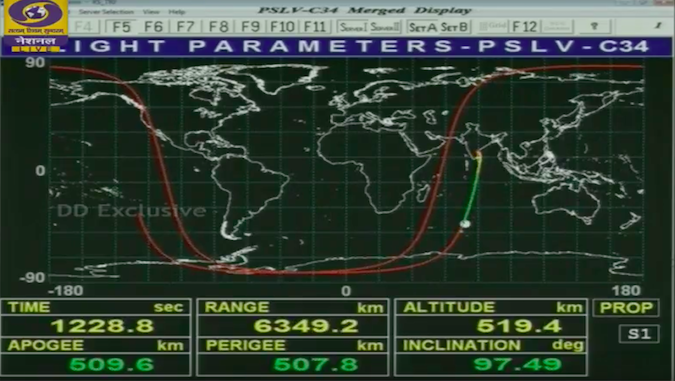 This plot from India’s launch webcast shows the orbit track and altitude achieved after Wednesday’s PSLV launch. The BIROS satellite developed by DLR, the German Aerospace Center, launched Wednesday is equipped with an infrared detector to find forest fires. About the size of a refrigerator, BIROS will fly in formation with Germany’s TET 1 satellite launched in 2012 to conduct tandem fire detection experiments as part of DLR’s FireBIRD mission. Designed for a 10-year mission, the FireBIRD satellites will supply data to researchers studying fires’ effects on climate and help officials identify what type of fire is occurring. The information will be transmitted to ground stations via a laser communications link, and also directly to mobile devices, DLR said in a press release. 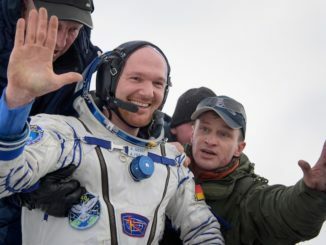 German engineers planned to release a sub-satellite named BeeSat 4 from the BIROS spacecraft some time after launch to test inter-satellite communications links. If BeeSat 4 is counted among PSLV’s payloads, the satellite count on Wednesday’s launch reaches 21 spacecraft, but the CubeSat was not deployed directly from the rocket. An Earth-observing microsatellite named Lapan A3 developed by Indonesia’s National Institute of Aeronautics and Space was also among the PSLV’s multi-satellite payload. Two CubeSats built by Indian university students rounded out the passengers on Wednesday’s PSLV flight. The 20 satellites aboard the launch marked the most ever carried on a single Indian rocket flight. “With today’s successful launch, the total number of satellites launched by India’s workhorse launch vehicle PSLV has reached 113, of which 39 are Indian and the remaining 74 from abroad,” ISRO said in a statement. An experimental objective of Wednesday’s mission was to restart the PSLV’s liquid-fueled fourth stage after deployment of the satellites. The engines on the fourth stage were expected to re-ignite two more times to demonstrate the PSLV’s ability to place satellites into different orbits on future flights. Preparations for the PSLV’s next mission are already underway at the launch base for a late July or August launch with India’s Resourcesat 2A satellite to monitor the use of water and land resources, a spacecraft to aid tropical cyclone forecasters, and the first two Earth observation satellites for Seattle-based BlackSky Global, which intends to send dozens of small commercial imaging spacecraft into orbit in the next few years. A mission by India’s larger Geosynchronous Satellite Launch Vehicle, or GSLV Mk. 2, will follow later in the third quarter of the year with the Insat 3DR weather observatory. In celebratory remarks after Wednesday’s flight, ISRO officials called on rocket suppliers to step up deliveries to raise India ever-growing launch rate. India achieved five space launches last year, the most in the history of India’s space program. That figure will be matched with the next PSLV mission in July, and exceeded later this year. Officials said quicker component deliveries, coupled with streamlined processing at the Sriharikota launch base, could raise the number of possible annual PSLV and GSLV launches from six to eight flights.